Romantic finca in the mountains with a great view on the sea. 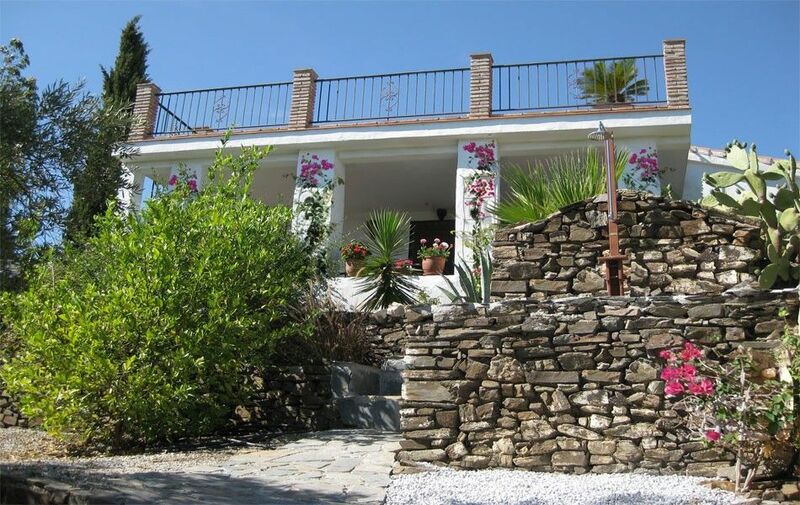 The hundred year old completely renovated finca is romantically located 500 m above sea level, approx. 3km away from Sayalonga. It offers dreamlike views across mountain ranges and the Mediterranean Sea. The finca is surrounded of a well kept garden with old trees and tropical plants, in quiet nature. The coast is reached in about 20 minutes by car. The charming small house contains a combined living/sleeping room with an open fire place, stereo equipment, TV, a small, fully fitted, built-in kitchen and a bathroom with shower. In front of the house there is a covered terrace. Garden furniture, bed linen and towels are included. White stone furniture under shadowy trees invite you to sit and forget the world. The outdoor accommodation is ideal with a good size pool, big wide views but still privacy. Indoor accommodation is basic but functional and rustic. The really lovely stone shower is stunning. The location up in the hills is ideal to get away from the busy Costa del Sol seaside area and we found we preferred being by our pool than by the sea. Easier to get a drink, get some shade or go to the loo! And no worries about leaving your belongings on beach while you swim. And it was hot so we needed refreshing dips often. The drive up is exciting and really makes you feel your in a remote place but its still easy enough to go down to beach or town. Sayalonga village was full of very helpful people. They even opened the supermarket for us when we arrived during the afternoon siesta! And the Bar - Restaurante Palustre felt authentic locals pub but we were welcomed by the friendly owner and we visited it everyday and not the others targeting the tourists. We only stayed one night at this property in order to go on holiday at a convenient time to us and Juergen was very helpful enabling us to do this. As was the Uli their local contact who helps manage the properties and drove in-front of us to the next property. The rest of our week we stay at Castia la Colina property number 2248677 to read my review of this one. It's just a good! So get on a plane, load up the hire car stock up on food and drink and ICE and relax! PS don't use GoldCar Rental - it's budget and that's why I picked it through rentalcars.com but being the cheapest meant we had to queue for an hour in the airport despite seemingly checking in on-line and also they add on stealth charges such as insisting of taking out a higher level of insurance. Next time I would prefer to pay a little more with a high quality brand such as Hertz. Genau der richtige Ort um abzuschalten und die Seele baumeln zu lassen. Saubere und gepflegte Anlage, mit gut ausgestatteter Finca. Es fehlt eigentlich an nichts. Dejligt hus med skønne omgivelser. Dejlig stor pool. Skønne faciliteter i huset. Dog mangler wifi. Vi nød stilhed og ro samt det skønne udsyn til hele området. Wir waren vom 20. - 29.06.2018 in dieser wirklich tollen (schnuckeligen) Finca. Wer die Ruhe und einen grandiosen Ausblick in die andalusischen Berge oder ans Meer liebt, ist hier wirklich an der richtigen Adresse! Im Vorfeld hat uns der Vermieter schon viele Tips und Info´s per E-Mail geschickt, was es alles an sehenswertem in der näheren und auch weiteren Umgebung gibt. Der Hammer ist aber wirklich der tolle Pool, den wir auch täglich nach unseren Ausflügen nach Granada, Ronda, Malaga oder El Torcal genutzt haben. Die Finca selbst hat eine funktionale Küche und außen einen Grill. Abend´s sind wir auch gerne die 2,5 KM nach Sayalonga gefahren und haben eines der 3 tollen und vor allem günstigen Restaurants besucht. Nous avons passé une merveilleuse semaine dans cette très belle finca. Au calme, avec vue sur la mer et les montages, à seulement 10 mn du très joli village de Sayalonga, cette finca est très bien équipée, avec tout ce qu'il faut pour passer de bonnes vacances. Nous y avons passé la première semaine de mai, l'eau de la piscine était très bonne et nous en avons bien profité. Très bon accueil à l'arrivée. Nous vous conseillons vivement cette location, vous ne serez pas déçus. Nous avons qu'une envie... y repartir !!! Die einmalige Servicepauschale beträgt 60 €. Sie beinhaltet Bettwäsche, Handtücher, Küchentücher Poolreinigung, Endreinigung und Wasser. Die kWh Strom wird vor Ort abgelesen, und nach Verbrauch berechnet. 0,28 Cent pro kWh.